Why recreational scuba diving? Discovery and adventure have always been part of humanity. Nothing else living on earth explores for the sake of exploration. Whether scaling Mount Everest or using the Hubble Space Telescope to view distant galaxies at the edge of the universe, only humans seek knowledge and embrace challenges for their own sake. It’s in our blood. It has driven much of our progress and many of our problems. As 21st century technology continues to shrink the earth, more and more people visit wider areas. Today, perhaps only 10 percent of the face of the earth is beyond reach within 24 hours. You can visit some of nature’s most spectacular monuments and view things that, a century ago, were sights reserved for the elite explorer. This progress comes at a price. While discoveries in science and technology may be endless, opportunities for discovering new places are becoming rare. We still marvel at the sight of Victoria Falls, but we drive to it in comfortable vehicles along well-worn roads. We view it surrounded by other tourists. It feels like we’re visiting, not exploring. It leaves our thirst for discovery unquenched. Perhaps that’s one reason why recreational scuba diving has been one of the fastest growing adventure sports, professions and scientific avenues for more than three decades. While we’ve crawled and clawed across most of terrestrial earth, underwater we’ve barely looked. Even in coastal waters near a major city, it’s possible to visit and discover underwater locations that no one, or at most a handful, has ever seen. Without a doubt, the underwater world is the final frontier on earth and through recreational scuba diving you can go to his discovery. As a diver, you have access to this final frontier. You may go there for recreation, for work or for science – or a combination of these. Although recreational scuba diving is the most accessible form of underwater exploration for most people, technology allows us to go deeper or venture into more dangerous waters with submersibles and ROVs (Remotely Operated Vehicles). For many, the rewards of diving extend beyond adventure and exploration. Recreational scuba diving can take you to some of the most exotic destinations in the world, immerse you in new cultures and open new creative outlets. Through recreational scuba diving, you become involved with the environment in ways that can make a difference. As a diver, you enjoy a lifestyle that involves interesting people, new challenges, and social events. It’s a lifestyle you can enjoy close to home or at distant destinations. Recreational scuba diving is one of those rare activities that accommodate different interests and people. It can be high-charged and intense, or delightful and relaxing. Unlike many sports, in diving a seasoned pro can pair with a rank novice and have just as much fun. In this article, you’ll get a glimpse of all that underwater adventure offers. You’ll learn the differences and overlaps between recreational scuba diving and technical diving, as well as non-diving technologies for underwater exploration. We’ll touch on the top dive destinations around the world, and look at a few reserved for the elite underwater adventurist. It’s recreational diving that opened the seas, rivers, lakes and quarries to millions of people worldwide. Born with the invention of the scuba regulator by Jacques Cousteau and Emile Gagnan in the 1940s, recreational scuba diving has evolved from a sport only for daring, hardy young men to an activity enjoyed by both genders from about eight years old to whatever. Thanks to advances in equipment, training and support services over the years, today many adventurous people enjoy diving. Recreational scuba diving is therefore defined as diving no deeper than 40 metres (130 feet) within the no stop limits of recognized dive tables or dive computers. When diving within an overhead environment, the total horizontal and vertical distance to the surface may not exceed 40 metres/130 feet, and light from the surface must always be visible. To participate in recreational scuba diving without immediate professional supervision, you must have an entry-level certification such as the PADI Open Water Diver certification or higher. With changes in equipment and training requirements, you can enjoy a broad range of diving and activities within the limits of recreational scuba diving. Although you wear a short wet suit or skin suit for warm-water tropical reef versus a heavy dry suit for an early spring plunge into a kelp forest, both fall within the limits and definition of recreational diving. Description of Recreational Scuba Diving. As a sport and leisure pursuit open to the broad range of people, recreational scuba diving has simple equipment and training requirements compared to other forms of diving. It’s primarily equipment limitations that have set the limits for recreational scuba diving; one of the biggest safety advantages of recreational scuba diving is the ability to, at any time, make a direct ascent to the surface should you have problem. Recreational scuba diving is limited to about the top one percent of the ocean’s depth, yet this thin sliver is far more than you can explore in a lifetime. This upper region is the portion of the sea that sunlight reaches, which is important from a biological standpoint. Coral and kelp ecosystems, for example, exist primarily above 50 metres (165 feet) because coral and kelp depend on sunlight. Most of this growth is shallower than 30 metres (100 feet). Therefore, although recreational scuba diving limits you to a mere fraction of the ocean’s total volume, it’s the right fraction – the underwater regions that are the most productive exciting and beautiful. Technical scuba diving – tec diving for short – is a relative newcomer to the world of underwater exploration. Tec diving is sport diving that uses extensive equipment and procedures to dive beyond the limits of recreational diving. Tec diving has higher potential risk than recreational scuba diving, so participants require more elaborate and intense training, plus ample experience and the willingness to accept the risks. Compared to recreational scuba diving, tec diving is a niche activity suited to a much narrower proportion of participants. Although it’s hard to put an exact date on when tec diving began, its roots go back to the emergence of cave diving in the 1960s and 1970s. By the mid-1980s, cave diving was an established specialized form of diving, and a small cadre of wreck divers on both sides of the North Atlantic had begun applying cave diving equipment and procedures to other environments beyond the limits of mainstream recreational scuba diving. The term “technical diving” and its recognition as a distinct division of diving came in the early 1990s with the publication of aquaCorps, a magazine dedicated to it. At least five distinct subdivisions exist in tec diving: technical deep diving, trimix diving, cave diving, technical wreck diving, and technology-specific diving. Each of these has its own distinct set of demands and requirements. Part of the appeal of tec diving is that it pushes the envelope, constantly trying to extend the distances, depths and durations of sport diving. Because of this, we can’t define concrete boundaries and limits for tec diving; rather we define tec diving partly based on what it’s not. Technical diving then is diving other than conventional commercial or research diving that takes divers beyond recreational diving limits. It’s further defined as and includes one or more of the following: diving deeper than 40 metres (130 feet), required stage decompression, diving in an overhead environment beyond 40 linear metres (130 linear feet) from the surface, accelerated decompression and/or the use of different gas mixtures on a single dive. As an important point, simply exceeding the limits of recreational scuba diving does not make a dive a tec diving. That is, descending to 50 metres (165 feet) in conventional recreational dive gear isn’t tec diving. Recreational scuba diving limits – and limits set for all forms of diving – exist to address legitimate risk management purposes. They’re based on proven experience and outcomes; you manage risk by avoiding those practices that have proved to have a disproportionate number of unfavorable outcomes – accidents. What makes diving such an adventure? Besides being an avenue to the earth’s last frontier, it’s a lifestyle that involves people of all ages and cultures. As you’ve already seen, there’s more to diving than breathing underwater. Rather, as described in the PADI Open Water Diver course, diving involves what you do underwater – it’s about going places, doing things and doing these with other people. Remember this and you can dive your entire life with new adventures and experiences on the horizon. Part of the diving lifestyle is seeing new sights and visiting new places. You can explore almost anyplace there’s water whether a beautiful tropical coral reef, a temperate water kelp forest or an inland lake, quarry or river. Part of the adventure is visiting and interacting with the new cultures you meet as you travel to go diving. For divers in North America and many in Europe, the Caribbean Sea is a destination of choice thanks to great diving, ready access by airline and hundreds of tropical islands, each with its own personality. The Caribbean hosts the densest concentration of dive operations in the world. Where it is – The Caribbean Sea lies in the Western Hemisphere, bounded by the northern coast of South America, the eastern coast of Central America, the southern coasts of Cuba, Haiti and the Dominican Republic and the western coasts of the Windward Islands. Lying near the equator (between approximately 10° and 20° North Latitude), the Caribbean sun provides the warm water and light necessary for the growth and propagation of coral reefs. This warm water flows north into the Gulf of Mexico and up along the North American eastern coast, moderating temperatures and providing tropical conditions as far north as Bermuda. For this reason, much of recreational scuba diving really isn’t in the Caribbean Sea, but in the Atlantic. In addition to Bermuda, the Florida Keys and the Bahamas lie north of the Caribbean proper, yet have the same types of climate and coral reef ecosystems, thanks to the Gulf Stream. Hence, you can think of these as the “extended” Caribbean. Dive conditions – In most of the Caribbean, poor dive conditions are relatively rare and usually don’t last long. For most of the year, you can expect visibility to rarely drop below 15 metres (50 feet), with more than 30 metres (100 feet) common. Water temperatures range from a low of 21°C (70°F) to more than 26°C (80°F), depending upon the season and latitude. This means you usually need at most a light or partial wet suit, and often, you may not even need that. Poorer conditions usually follow rains, storms and other weather, though “poor” may be a relative term. In many popular dive environments, 10 metres (33 feet) of visibility is good, yet that’s a poor day at most Caribbean sites. Visibility is generally best during the dry (summer) seasons, though that’s also when it’s hottest. Most Caribbean recreational scuba diving takes place from charter boats on the prevailing lee side of islands, though many locations have excellent shore diving as well. Waves tend to be low to moderate on an island’s protected lee side, disrupted only by an unusual wind blowing in the reverse direction. 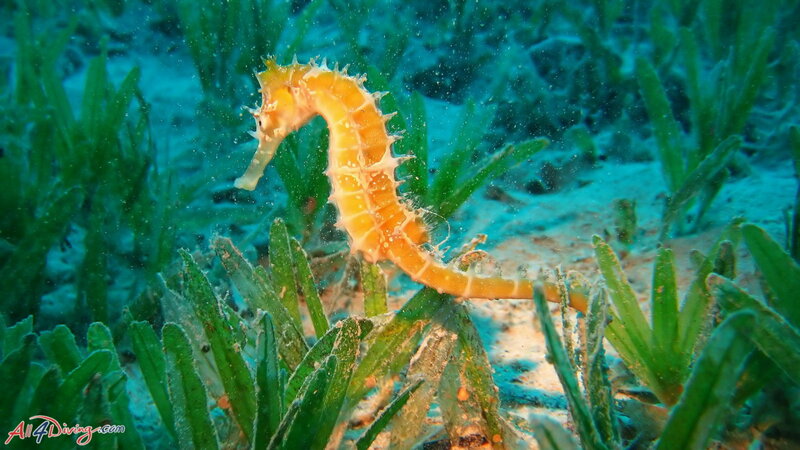 Again, this is most common during the winter and spring, and does not necessarily stop you from diving. People and culture – If you want to meet or immerse yourself into many different cultures and ways of life, the Caribbean is the place to do it. Dozens of cultures make their homes there, plus islands and coasts differ geographically in size and origin. Consequently, both national and natural influences shape each destination, creating distinct cultures and subcultures everywhere you go. Speaking very generally, most Caribbean cultures consist of a mix of European and either aboriginal or African-originating people. English is widely spoken thanks to tourism and influence from the US, with European languages – particularly Spanish – common to many islands. Additionally, you find regional dialects that blend many tongues and are spoken on only one or a few islands. Politically and economically, Caribbean nations vary tremendously. The majority of popular dive destinations exist where there are stable governments and economies. However, it’s always wise to check travel advisories before heading anywhere internationally. 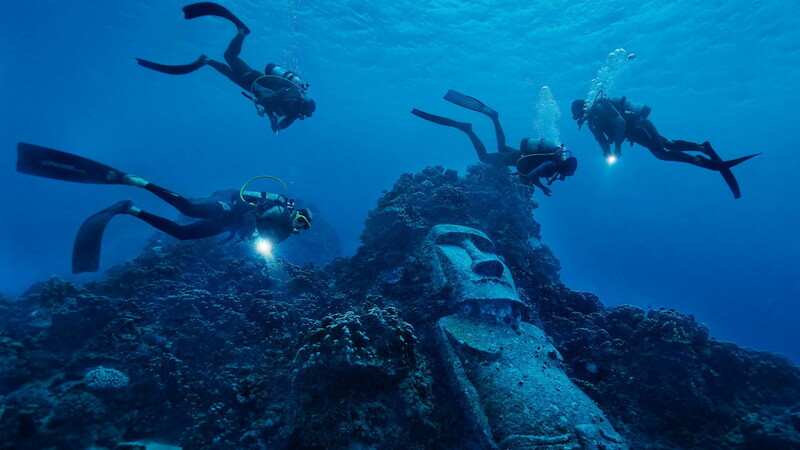 The Central-South Pacific is a popular destination for divers from both sides of the Pacific Rim. Thanks to its huge expanse, recreational scuba diving in this region varies dramatically from one area to the next, with many sites that have yet to be visited by anyone. Where it is – The “Central-South Pacific” is the broadest region as defined in a diving context, covering more than one-eighth the surface of the world. The Central-South Pacific proper is defined roughly as the Pacific Ocean region bordered by the Tropic of Cancer (23° 30’ North Latitude) to the north, Australia, New Guinea and the Philippines to the west, about 135° East Longitude to the East, and the Tropic of Capricorn (23° 30’ South Latitude). Dive conditions – Covering a broad area, the Central-South Pacific offers a range of dive conditions and types of recreational scuba diving. Nonetheless, the popular spots share the characteristics of predominantly warm, clear water (24 metres/80 feet or better visibility) for most of the year. Since the Central-South Pacific straddles the Equator, the most northern and southern areas experience the opposite seasons of the Northern and Southern Hemispheres. Water temperatures tend to vary from 28°C (82°F) to 29°C (85°F) during the warm months to as low as 22°C (72° F) in the cool months. The closer you are to the Equator, the less variation you have in temperature. Much of the Central-South Pacific experiences pronounced dry and wet seasons, both influenced by El Niño warming in the southwestern Pacific in the years it occurs. Waves and currents tend to be more of an issue among Central-South Pacific dive destinations. The Pacific is a large, uninterrupted expanse that can allow winds to build seas into large, uncomfortable swells. When this happens, where possible, diving moves into the protection of islands’ lee sides or the inside of barrier reefs. In some places, drift diving with the current is the standard procedure. Many of the Central-South Pacific’s coral reefs are huge, including the Australian Great Barrier reef, which is the world’s largest coral reef and the largest natural feature on earth. It is more than 2300 kilometres (1430 miles) long, protecting about three-quarters of the Queensland, Australia coast. Besides abundant coral ecosystems, many Central-South Pacific destinations offer spectacular wreck diving, mostly the remains of vessels and aircraft lost during World War II. Among these are Chuuk (Truk) Lagoon and Bikini Atoll. Chuuk is a giant protected lagoon in Micronesia that was a major Japanese naval base during World War II. Many Japanese ships went to the bottom there due to US naval aircraft strikes, making this perhaps the densest concentration of major shipwrecks in the world. Bikini Atoll has several major warship wrecks left from US atomic testing shortly after World War II. People and culture – Cultures in the Central-South Pacific show Asian, European, Indian and American influence, but most cultures have strong ties to their aboriginal roots. This is particularly true with the many islands originally populated by Melanesians and Polynesians. The Melanesians including Papua New Guinea, Vanuatu and Fiji. The seafaring Polynesians are thought to be the aboriginal people who populated Samoa, Marquesas, Tahiti, Hawaii and the Cook Islands. Anthropologists think that Melanesian and Polynesian blood may have been mixing in some places long before European contact. European colonialism and World War II left their marks. Some countries have major populations of European origin, such as Australia and Tahiti. Fiji has a large Indian-origin population as a result of British colonialism that brought in laborers from India in the 1800s. Following World War II, several island groups captured from Japan became US territories. Some of these have since gained their independence and others remain US soil, but either way the American influence there is strong. A rising cultural influence is tourism, particularly from Japan. Due to their proximity to Japan, islands in this region provide choice tourism destinations for the Japanese – and increasingly Koreans, Taiwanese and other Asian cultures – much as Caribbean destinations do for North Americans. As a result, Japanese is becoming a widely spoken language, with many facilities catering to Japanese clientele. The next largest region, from a diving perspective, is the Central-South Pacific’s next door neighbor. Bordered by three continents and home to thousands of islands, this region offers tremendous coral reef diving above and below the water. The Indo-Pacific is know to offer the most exciting recreational scuba diving. Where it is – The Indo-Pacific region consists of the Indian Ocean and South China Sea, bordered to the north by Asia, to the west by Africa and to the east by Indonesia, Australia and the other large islands that connect them. This area can also be considered the Pacific, hence the reference to “Pacific” in the region’s name. The Indian Ocean has three broad areas to the east and west of India called the Arabian Sea, the Bay of Bengal and Andaman Sea (Thailand, Myanmar and Malaysia). The southern border is generally considered the latitudes at the tip of Africa, so part of this region is more temperate. It is, however, best known for the diving in the tropical latitudes at locations on both its west and east borders. Dive conditions – For most of this region, the clearest and calmest conditions occur during spring and fall. Much of the Indian Ocean experiences a plankton bloom in the last months of the year, but while this reduces visibility, it also provides opportunities to see large plankton feeders like whale sharks and manta ray like those on the photo, seen during a Similan Islands Liveaboard diving in Thailand. Although much of this region is in the low latitudes near the Equator, you still see pronounced seasons, particularly to the west, much as you do in the Central-South Pacific. These areas have distinct wet and dry seasons, with the most rainfall during the March to October. Low latitudes to the east, particularly locations, between India and Australia, such as Maldives, Myanmar, Thailand, Malaysia and Indonesia, have less seasonal variation. Water temperatures tend to vary from 28°C (82°F) to 29°C (85°F) during all year round. The marine life is spectacular in Indo-Pacific area with the most rich aquatic life compared with the rest of the world. Coral reefs are prolific and have an incredible biodiversity. Many marine biologists call the Indo-Pacific the biological center of the world’s coral environments because there’s a greater variety of organisms found here than on any other coral reefs. As you move away from the Indo-Pacific, you find fewer varieties of the species living in coral habitats. People and culture – Bordered by three continents, probably hundreds of cultures have influenced this region. To the west, aboriginal African cultures are dominant on coastal islands like the Seychelles and Madagascar. Western areas had early influence from Arabic sailors and explorers, with European influence (especially the British) as early as the 1500s. Many islands, like the Comoros, have populations that are a mix of Asian, Arabic, African and European. To the east, cultures like the Melanesians and Asians were early dominant populations in this region. European influence is particularly evident in some of the island states because they were easily conquered during the periods of European colonialism, although today most are independent nations. Japanese influence also exists, partly due to Japanese occupation during World War II, but more strongly today due to tourism. Compared to the other major divisions of the diving world, the Red Sea is small and much less diverse in terms of climate and recreational scuba diving. It is geographically the closest tropical diving destination for Europe and the Middle East, making it very popular with divers from those areas. Where it is – The Red Sea lies between Africa and Asia, with Egypt, Sudan and Ethiopia on its west boundary and Saudi Arabia and Yemen on its east. It links the Mediterranean Sea with the Arabian Sea and Indian Ocean thanks to the Suez Canal. Jordan and Israel also have some Red Sea coastline on the Gulf of Aqaba. Egypt, Jordan and Israel are the primary destinations for divers visiting the Red Sea. Dive conditions – Surrounded by a desert, one of the most notable differences of the Red Sea is that it is saltier than other seas by about 20 percent. Consequently, you need more weight while diving there. Water temperatures for most of the Red Sea range from 24°C (75°F) to 26°C (79°F) at the surface, with air temperatures ranging from about 27°C (81°F) to a staggering 55°C (130°F). Drift diving is common due to very strong currents caused by tidal shifts. The Gulf of Aqaba is more moderate, with surprisingly cool water – 18°C (64°F) to 26°C (79°F). The average air temperatures range from about 17°C (63°F) to 32°C (89°F). Currents are not as much of an issue in the Gulf. Underwater, most Red Sea diving is characterized by coastal fringing coral reefs as opposed to the large barrier reefs founds in other parts of the world. The reason is that the Red Sea plunges sharply into deep water, leaving only a relatively small area of the bottom in the warm, shallow water coral requires. Coral growth is much more developed in the northern parts of the Red Sea (where the diving’s most popular). There’s less growth where nutrient-rich water flows into the Red Sea from the Arabian Sea because coral grows in relatively nutrient-free water. Species diversity in the Red Sea coral communities is less rich that found on Indo-Pacific and Central-South Pacific coral reefs, but more than the Caribbean. People and culture – By far, Arabic people dominate the regions surrounding the Red Sea. The noted exception is Israel, which is a Jewish state, but even it has a large Arabic population. The Middle East has and continues to be an area with cultural and national conflicts, but this has not usually deterred recreational scuba diving. This is because the areas you frequent for diving are generally remote from conflict areas. Depending upon the political climate you may need to use caution at times, especially if your national/cultural background is involved in a local conflict, but this is not normally an issue. The Mediterranean Sea is the birthplace of scuba diving as we know it. It was here in the 1940s and ‘50s that Jacques Cousteau and his team made their pioneering dives with the first open-circuit scuba – the device that opened the underwater world to common people everywhere. As the marine highway that connects southern Europe, northern Africa and eastern Asia, sailors have traveled the Mediterranean for more than 4000 years. Not surprisingly, modern underwater archaeology was also born in the Mediterranean with the excavation and documentation of pre-Greek shipwrecks in Turkish waters by Peter Throckmorton and George Bass in the 1960s. The world’s first underwater park is in the Mediterranean. Today the Mediterranean remains a popular dive site, particularly with Europeans, but with international travelers as well. Where it is –The Mediterranean Sea lies between Europe and Africa. Although it is small compared to the Atlantic or Pacific Ocean, more than a dozen countries have Mediterranean coastline. Regions within the Mediterranean are also named as seas, such as the Ionian Sea between Italy and Greece, and the Aegean Sea between Greece and Turkey. People dive in many sites along the coastline, with the majority of spots located along the European coastline, although there’s diving along the African coast as well. Several Mediterranean islands like Mallorca, Malta and Cyprus are popular tourist destinations with resort diving. Dive conditions – The Mediterranean is a temperate water dive environment. Although it doesn’t have tropical coral reefs, popular Mediterranean reefs are rich in fish, invertebrates, kelps and other cooler-water marine life. The flora and fauna are abundant enough that the world’s first underwater park was established in the Mediterranean off of Portofino, Italy (near Genoa). Temperature range varies considerably through out the Mediterranean Sea, though not as widely as most temperate areas. In the central Mediterranean, water temperatures range from lows around 13°C (55°F) in the winter to highs around 28°C (82°F) in the summer. Visibility at the popular island locations ranges from 20 metres (65 feet) to 30 metres (100 feet). Currents tend to be none to mild, and there’s not much tidal fluctuation. Because the Mediterranean is small compared to an ocean, it is also relatively calm. However, winds and storms can make boating and recreational scuba diving hazardous at times, just as they can on any major water body. Above water, the Mediterranean climate is desert-like, moderated by the sea. It is dry and hot in the day, and typically cool at night, with the European side more mild than the African coastline. Because of the dry climate and its small size, the Mediterranean has saltier water than most of the world’s oceans. People and culture – Given its history as the maritime hub of western civilization for centuries, a multitude of peoples and cultures populate the Mediterranean coastlines. Arabic people dominate the southern and eastern coastlines, with European culture dominant on the northern coastlines. Non-divers commonly think that recreational scuba diving means you have to have warm, gin-clear water. The truth is that with modern dive suits, you can be comfortable in surprisingly cool water, and it’s not how far you see, but what you see that makes the diving good. Recreational scuba diving is popular around the world in almost every body of water. Temperate ocean – You’ll find recreational scuba diving in just about every region where the ocean touches land. Off the United Kingdom, the west coast North America, around New Zealand and other places, divers explore kelp forests. Diving is popular in the East China Sea, Yellow Sea and the Sea of Japan. Wreck diving is popular all along both coasts of the North Atlantic. Temperate ocean offers some of the most beautiful diving available, and you can find it in both hemispheres and along every continent except Antarctica. Inland recreational scuba diving – Inland, away from the sea you’ll find divers exploring natural and man-made bodies of water. These include reservoirs, mountain lakes, flooded quarries, springs and rivers. Visibility can range from a couple metres/feet to clearer than the clearest ocean water. The popularity of such places can be staggering – there are flooded quarries in the U.K. that each host hundreds of divers per day during the summer. Some inland bodies of water, like the North American Great Lakes, are actually freshwater seas that have had the same roles in culture and commerce as large seas. Because cool, fresh water supports fewer organisms and slower metal oxidation, many of these areas offer recreational scuba diving on wrecks that are far better preserved than comparable size and age saltwater wrecks. This is particularly true of wooden hulled craft, which deteriorate and collapse in only a couple decades in tropical seas, but which can last well over a century in the depths of a lake. Recreational scuba diving in rivers is very exciting because they have their own personalities. In many, you enter upstream, drift with the flow and exit downstream. Other rivers flow slowly, so you dive them more like diving a lake. Some, like the Ichetucknee in Florida, USA, have high recreational scuba diving activity because of their clear water and abundant life. Others have poor visibility but appeal in other ways. You can only see about two metres/six feet in the Cooper River in South Carolina, USA, but you go there to look for fossils, especially prehistoric shark teeth. With access to new methods and tools plus modern travel, today divers explore places that were practically beyond reach only a generation ago. Today’s technical and scientific divers routinely dive distances, depths and durations that would have been record breaking – or at least hot news – less than two decades ago. In the Mexican Yucatan, exploratory cave divers have mapped submerged caves with upwards of 14,000 metres (46,000 feet) of passage, with the longest mapped to 120 kilometres (74 miles) of passage. Relatively novice cave divers (not novice divers) commonly make dives that take them 600 metres (2000 feet) from a cave entrance – a dive that few seasoned cave divers accomplished in the 1970s. More than 20 years since the first serious cave exploration began in the Yucatan, divers still discover new caves and unexplored passages. Palau in Micronesia is a top tropical dive destination, but it has a lesser-known unique site – Jellyfish Lake. A decent hike inland and upward (but you only need your snorkeling gear and a dive skin suit), Jellyfish Lake is home to a unique species of jellyfish that has little sting potential. Divers find themselves surrounded by literally hundreds ranging from thumbnail-sized to big enough to cover your torso. It is a delightful, one-of-a-kind experience found nowhere else. In Missouri, USA, you’ll find Bonne Terre Mine, one of a few underground man made dive sites. Originally a giant mining operation, Bonne Terre flooded with ground water after mining ceased, resulting in a giant, underground lake with cool, still, clear water. Escorted by trained guides, even beginning divers explore the mine remnants (you dive in marked areas where you always have an air space over your head, so it’s not a cave dive), which include shacks, tools and other structures left by the miners. The end of the Cold War opened another unique type of dive site – missile silos. After being shut down, cleaned up and deregulated, many silos fill with ground water, resulting in dark, deep shafts with artifacts from their operational days. Many are so deep that only technical divers are qualified to reach the bottom, which may be below the recreational scuba diving limit of 40 metres (130 feet). Scuba divers have been exploring under ice for more than 50 years, but today it is increasingly common, not just under frozen lakes, but under Arctic and Antarctic ice. It’s a chilly experience, even in the most advanced dry suits, yet tolerable. Thanks to abundant sea life and nature’s talent with ice sculpture, almost without exception, all who plunge under ice at either pole are glad they did and ready to go back. Once the domain of only a handful of underwater explorers, limited specialty tours regularly take divers to the ends of the Earth to visit a world that few ever see. This list of unusual or unimagined dive sites could go on, but ultimately it would be endless. This is because underwater explorers find new, interesting and extreme places to go practically daily. As a Diver, you join millions of others to form a growing force that can and does make a difference in the effort to preserve the underwater world. PADI courses encompass environmental awareness and protection philosophies that emphasize the importance of protecting fragile aquatic ecosystems. The worldwide PADI organization is committed to preserving the aquatic environment for future generations. Diving won’t survive without beautiful places to visit, and Divers are encouraged to take action with Project AWARE® and make every dive count for a clean, healthy ocean planet. All4Diving Phuket – Samir Y.